With the growing awareness of misuse of IPC Section 498A, one would consider that the Parliament would get more sensitive towards a burning issue which has destroyed families, ruined careers and extinguished innocent lives forever. But reality seems different. Section 498A of the IPC has been notorious as the world’s highest misused matrimonial law. It was passed in the year 1983, a distant 30 years ago. In such a long duration, it would be considered that, any just society would have made some amendments to check its misuse. But every time, there is some hope of any positive changes, the law-makers develop cold feet and withdraw from amendments. In our folklore, even to describe an antiquity for ghosts, the term used is ‘bees saal baad‘ i.e. ’20 years later’ which means that 20 years is considered as a long period, then 30 years of dragging feet by the lawmakers is inexplicable. These cases are notorious as 90% accused are chargesheeted, but less than 10% are found to be culprits leaving out a whopping 90% of innocents who have paid the price of being from the grooms family. So after about more than 30 years and 30 Lakh cases it would be assumed that the AccheDin sarkar would give some relief for the innocents trapped in these cases. The nature of the problem with Sec 498A is that this law being cognizable, non-compoundable, non-bailable meant that it would be a cakewalk for the wife to accuse anyone of harassment, on the other hand the accused would have a harrowing time in the courts, since in our country the ‘process itself is the punishment’. Right from a 2 month old baby to 90 year old senior citizens have faced arrests due to this law for ‘dowry harassment’. Committees after committees and commissions after commissions have called for amendments in this law. The non-bailable aspect of the law meant that this would feed a thriving bail industry, where hapless families would try to get bail ‘at whatever cost quoted‘ by the lawyers to save themselves from arrests – because arrests would, in many cases mean an end to the careers of the accused. The industries which fed on the evil nature of this law would not let any changes to come forth. Justice Malimath committee had given a report demanding that the law be made bailable and compoundable. It is interesting to note that the Acche Din sarkar is planning to make the law compoundable. which means that the accuser wife can withdraw the case upon reaching a compromise. It does not lie in the purview only of the High Courts, to quash a case upon withdrawal of accusations from the wife, but even a lower court can do this, which means faster completion of cases. Andhra Pradesh had brought about this amendment, they made the law compoundable with effect from 1-8-2003, for cases filed within Andhra Pradesh under Sec 498a. So it would serve as a great prelude to understand what India might experience, once the same amendments are implemented nation-wide. Consider the period of 2001 – 2010, a brief period before the law was made compoundable and a significant period after the amendment. While a total of 1,73,180 cases of Section 498A were registered nationwide in 2001, the figure touched a humongous 3,57,347 in 2010 which was an increase of 106.34%. 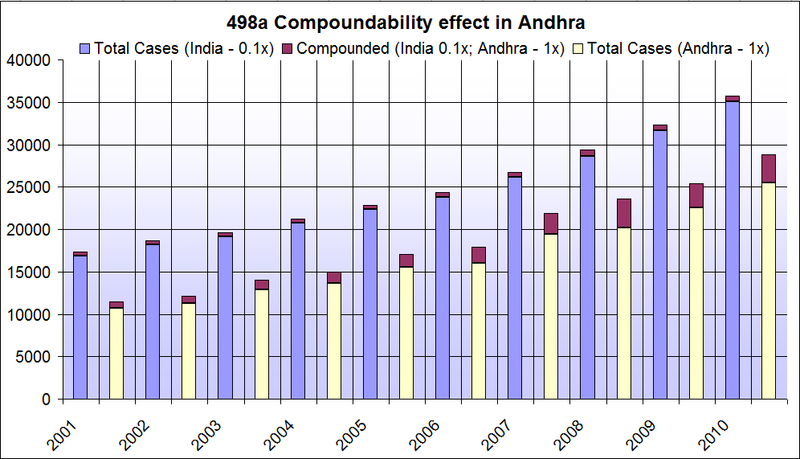 Meanwhile in the same period, Andhra Pradesh which had 11,423 cases in 2001 jumped an unimaginable 151.95% to 28,780 cases. Almost 50% more than the national average. 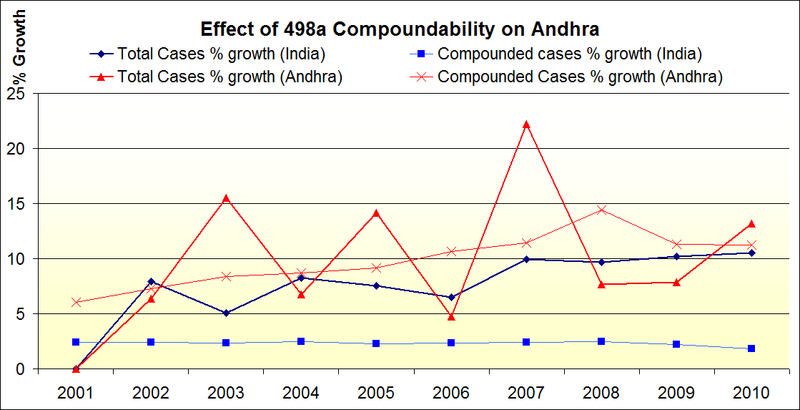 The image treats the Total India cases by a factor of 0.1x for ease of comparison and the image clearly shows that the number of cases in Andhra Pradesh has been a great contributor as the number of compounded cases has increased over the years. It is significant to note that, in simple practical terms compoundability of a law, means that the accuser wife controls the proceedings of the case and can decisively plan, when the case can be dropped. From the time she files a complaint up to the time the case is withdrawn, she completely controls what happens with the case. It is upon her whim and fancy that the troubles of the accused husbands family depend. In most of the cases, the accused would want to give in to extortion and compromise. So in other words, making Sec 498a compoundable only increases extortion. Men’s Rights organisations have been demanding that the law be made bailable, as the immediate arrests upon filing a complaint have harassed men the most. Supreme court calling this as legal terrorism, has asked for strict implementation of guidelines before arrests, but the fear of arrests still looms large over innocent husbands and their families. The true amendment which can have any effect on the deliverance of justice over misuse of Sec 498a would be that the law is made bailable. Even Justice Malimath committee in its report, which the government is citing as a justification, had recommended to make it bailable along with making it compoundable. This would help in simplifying the matter for the police as well, who are supposed to carry out an investigation and represent before a magistrate, in any case before making arrests. The guilty would be held accountable during this investigation by all means. But more importantly, making it bailable takes away the ignominy of young children, senior citizens and innocent men lining up to courts for anticipatory and regular bails. It would give peace to innocents, so much so that they won’t have to cringe in fear at the ring of the door bell every Friday after 5 PM fearing arrests. It would no longer mean that a woman having extra-marital affair could threaten her husband of dire consequences, if he disclosed her adultery to anyone. If instead of this, the unjust piece of legislation is made compoundable, then it would be a case of the cure being worse than the malaise. The number of cases would only keep increasing, burdening the courts with petty familial fights turned into resource drainers of the state, which would depend solely upon how much price the wife puts on the peace to be bought by the man. Honourable Prime Minister Modi’s government has a wonderful chance to correct a great historical wrong of independent India. We can only hope that Sec 498a is made bailable, as the husbands innocent families have been hoping, ever since this draconian law was passed.